The women stood there puzzled, when suddenly two men in bright shining clothes stood by them. Full of fear, the women bowed down to the ground, as the men said to them, "Why are you looking among the dead for one who is alive? He is not here; he has been raised." When I’m writing a sermon one of the important questions that I ask myself is "So what?" How does this text or story from the Bible affect me and how will this text touch the lives of those who are sitting in front of me on Sunday morning? I can tell you all kinds of interesting biblical facts and retell a Bible story or parable in some very interesting ways; but if all I am doing is passing on a whole heap of information then I haven’t answered the question "So what?" Or if the listeners are so engrossed in the speaker or the biblical knowledge and miss the "so what" then they have missed that moment when the Word of God touches them and changes them. There is no doubt about the message of Easter. Jesus who died and was buried on Good Friday has risen from the dead. The message the women were told early on Easter morning is clear, "Why are you looking among the dead for one who is alive? He is not here; he has been raised" and then throughout the day Jesus appeared to his followers. Every doubt that the women were talking rubbish disappeared. Jesus is alive! Now comes the "so what" question. That’s a very interesting story and I believe it to be true but how does this affect my life in the here and now? How does that change the things that are happening in my life right now? Jesus is alive! So what? I want to start by telling you about a young lad who lived in the first half of 5th century. When he was 16 years old he was captured and taken to Ireland as a slave. He managed to escape and return to his family in Scotland. A few years later he had a vision of a man calling him to go back to Ireland and over the next 40 years he was responsible for converting Ireland to Christianity. This man is St Patrick of Ireland. You might be asking yourselves, "That’s all very interesting but so what?" That’s good and here comes the answer to that question. He wrote a morning prayer part of which goes like this. In this prayer is the answer to the question "Jesus is alive – so what?" Jesus died and rose from the dead. He ascended into heaven after 40 days. Jesus is not just alive somewhere in heaven or out there somewhere but present with us right now in all that excites us and all that saddens us. 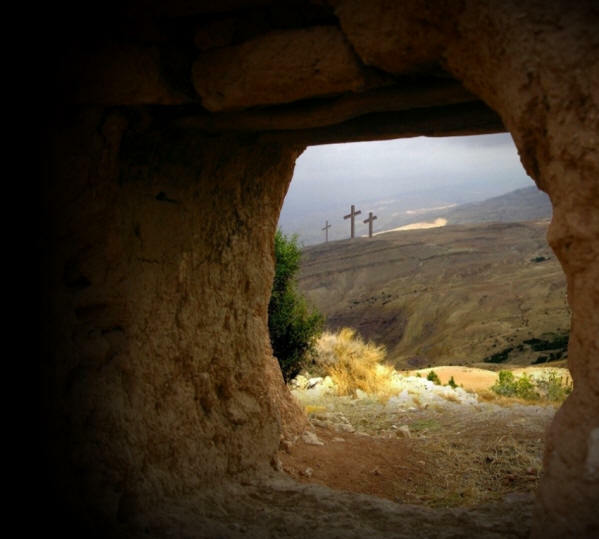 He is alive – risen from the dead and glorified. Since his resurrection and ascension he is now powerfully present with us whenever and wherever we might be and whatever might be happening in our lives. Christ in us, behind us, before us, beneath us, above us – as the prayer says. He is present to guide and shield us and save us from all evil. He is right beside us when we feel vulnerable and afraid. He is with us when we are depressed. He is present comforting and supporting us in sickness, old age and at our dying moment. As the prayer says - Christ is on our right and on our left; when we lie down and sit and stand. He is with us in the people who care for us and love us and help us. Christ is in the heart of everyone who reaches out to us when we need his presence. If Jesus had not risen from the dead on the first Easter morning then this prayer of St Patrick would be absolutely senseless. Jesus in the tomb was as dead as anyone could be. We respect the dead but a dead man can do nothing to change what happens today. it transforms our thinking about how we are able to cope with the things life throws our way because we no longer we think of ourselves as standing alone against all kinds of trouble; the living Christ is with me, before me, behind me, in me, beneath me, above me. St Patrick is saying that even though there may be times in our lives when we don’t feel Christ’s closeness, there is absolutely no time when he is not right there with us and in us. There is nothing that can happen in a day (and remember that St Patrick’s prayer is a morning prayer) when Christ will not be there to help us through the day. The living Christ changes our world. Just look at the disciples after Jesus’ death. They are lost and can see nothing bright in their future. They are despondent and sad. What hope and comfort could a dead Jesus in a grave offer them? When Jesus appears to them we see whole new thing happen to those people - his presence gives peace and strength and purpose and joy and hope to their lives. After his resurrection, Jesus comes to his disciples mysteriously on the road to Emmaus, behind locked doors in Jerusalem, on the beach of Lake Tiberias, and near the town of Bethany: he appears to them and they realise that Jesus is there with them all the time - Christ is above them, on their right and on their left. He changes their doubts and fear into trust and confidence as he says to them, "I will not leave you orphaned" and "I am with you always". It’s no different for us. The same living Lord who gave his disciples strength and assurance through his presence, does the same thing for us today. When we feel lost, confused, alone and afraid, Jesus is here in us and beside as St Patrick’s prayer states. Every day is Easter Day because every day Jesus appears in our lives and offers us his peace in the middle of our fears, frustrations and insecurities, especially when things seem to be totally out of control. Even when death comes near we can remain strong and calm knowing that Jesus is our shepherd who is walking with us, his sheep, even if the way is dark and dangerous. He is the shepherd who never leaves his sheep and is always guiding and protecting and giving assurance of his love and presence. In your baptism you share in the resurrection of Jesus, and when you receive Holy Communion you receive the body and blood of the living Saviour he gives you the promise and assurance that he is truly present with you every day of your life and will make you strong in body, mind and soul until the day you leave this life to enter eternal life. In your moments of fear and depression and in your moments of joy and celebration, Christ is on your right and on your left. The eye of Christ is on you to shield you from harm, to guide you in the choices you make, to hear your every sigh and every prayer, to give you "the strength of heaven" (to use St Patrick’s words) when trouble, sickness and death scare the living daylights out of you. Wherever you lie down – on your bed at home, in a hospital bed, or even in the grave – the powerful living presence of Christ will never leave you. His love will never forget you. You will never be lost. Christ in the heart of everyone who thinks of me. Amen.